Vernon luxury homes for sale offer an exclusive type of upscale experience that's unique to this gorgeous region. Driven by the appeal of the city's economic opportunities as well as its beautiful Okanagan setting, Vernon's luxury real estate market is rapidly expanding. This small, scenic city is ideal for luxury living, with its lush, fruitful landscapes, deep, fresh lakes, and sun-speckled foothills. Once ranked as one of North America's most desirable retirement spots, this formerly under-the-radar community is now recognized as an optimal place to enjoy a high-end lifestyle and sample prime British Columbian recreation, year-round. In the city's wooded hills, there are spectacular wood chalets and luxe cabins. In its suburbs, there are a range of breathtaking traditional and Craftsman-style estates, alongside plush family homes. The outskirts are lined with land-rich properties and acreages, while new developments boast custom homes and cutting-edge architecture. Complemented by some of the finest scenery around, Vernon's luxury homes make for perfect retirement retreats, vacation properties, or beloved long-term residences. Explore all Vernon luxury homes for sale in the listings below. Below, discover more about luxury Vernon real estate and upscale lifestyle opportunities in the area. Sign up now and unveil our advanced digital search features for members. Access saved searches, subscribe to exclusive property updates, and view in-depth listing details on all Vernon luxury homes for sale. Luxury Vernon real estate is having a moment — this tier of the market currently boasts an impressive range of upmarket homes, pricing between the $800,000s and $5,000,000. New, more glamorous homes are consistently being built in picturesque portions of the Vernon area. Single-family, detached homes are a defining property type of the luxury market, capitalizing on the extensive space and ability for large, private abodes to be built. Some of these homes emit a rural, rustic vibe with incredible timber millwork designed in the style of a woodland cottage or alpine lodge. Others opt for a more traditional look, with timeless design and features that maximize the natural experience for residents. In these homes, you'll find large, spacious balconies, expansive outdoor spaces, and plenty of windows and skylights to emphasize the indoor to outdoor flow. Homes often come hand-in-hand with large parcels of land, allowing buyers to enjoy an exceptionally private living experience in tune with nature. Lakefront properties are popular choices among luxury buyers — their docks, boat slips, and exclusive beach access points make them particularly desirable for fans of waterfront life. Many of Vernon's luxurious homes were entirely custom built or crafted with significant buyer input, so a vast variety of unique, elegant features can be found across the market. Resort inspiration can be seen everywhere from the spa-style ensuites, heated floors, and high ceilings to the stone kitchen islands, multi-car garages, and smart home technology. New construction luxury homes are being built to supplement the selection of higher-end properties in the city. Unlike their established counterparts, Vernon's new luxury houses are unabashedly ultramodern, with one-of-a-kind designs that draw inspiration from conceptual architecture, urban penthouses, coastal homes, and classic European styles. Each is distinctively crafted, offering its own approach to contemporary luxury. Stunning lighting, finishes, colour palettes, and moods can be found in each home, as can private homeowner amenities. Such amenities can include everything from saltwater pools perfect for an evening soak, to natural rock features, wine cellars, lakefront terraces, and trails. Vernon is a lovely location to enjoy a picture-perfect luxury lifestyle. Home to the world-class resorts of Sparkling Hill and Predator Ridge, the city is a top-notch destination for upper-class living. The lakes are great for boating, fishing, and water sports, while winter offers a range of delights at powder-packed Silver Star Mountain Resort and Big White. 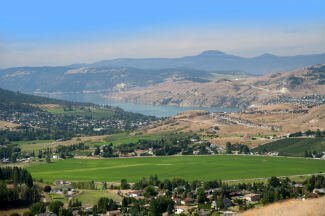 Beautiful golf courses and leisure centres are close to Vernon's homes, in addition to gorgeous parks and green spaces. Amazing wineries, orchards, and distilleries showcase the bountiful produce that comes from this region. As well, downtown's growing arts and culture scene is a major draw. New, delightful restaurants, cafes, bars, and shops demonstrate Vernon's transition from small settlement to one of the province's premier cities. Contact Vantage West Realty for the latest information on the Vernon luxury real estate market. Give us a call if you like any of the beautiful homes you see, or if you just want to explore your options. You can reach our team at 1-250-717-3133.